My FAA pilot’s license is current again, after flying three years on an EASA one. I thought it might take a few flights until my logbook would be signed by a flight instructor but it actually took only two hours of briefing and 1.6 hours of flight. Furthermore I have gotten a few job offers in town – although I didn’t end up in an engineering office I am happy about the job I chose for now. The briefing at the airport included a review of all airspace in the United States, charts and rules about currency. I didn’t forget too much in the last years so I was good to go for a flight at Centennial. I had to read aloud the raw METAR and TAF weather report, which was no problem. Part of many METARs was the word VIRGA in the remarks section. As my last blog entry pointed out, this phenomenon is almost daily visible in Denver. The dangers of virga, I learned, are the quick cooling of air, which then descents at high speeds and results in a microburst – the treacherous wind that took down several commercial jets in the last century. My CFI briefed me well on the air traffic control communication. Due to the amount of traffic, transmitting on radio is limited to a minimum. I wasn’t allowed to transmit until the runup (engine check) was completed, thereafter I advised ATC: “Centennial Ground, Cessna 43Lima, at Charlie 1, runup completed, south-east departure with Lima.” Then the ground controller told me to “monitor tower frequency” before reaching the holding point of the active runway. So instead of me telling the tower if I was ready to go, the tower told me when to line up and takeoff. I simply had to be ready to go. The first and last transmission from Tower was: “Cessna 43Lima, cleared for takeoff runway 35 right, south-east departure approved.” After my readback I took off, turned to the right and left the airspace. No further calls – keep it simple. We flew southbound over sparsely populated areas, fields and canyons. After some clearing turns I had to demonstrate steep turns, a power on and power off stall and a good sense of orientation. It all went fine so we decided to explore the training areas a little more. Back at Centennial my task was to show some nice landings, including power off, no flaps, forward slip (c’est une glissade) and a short field landing. The goal was to turn off the second taxiway from runway 35 left. Well, I accidently made the first taxiway after about 1700ft or so because I am used to the short landings in Switzerland. But I have to say that it took me about five landings to get used to the density altitude of 8600 feet. I really had the feeling I was moving fast above the ground, so I always ended up floating down the runway. I was used to steeper approaches in thicker air. Back on the ground I received the instruction to cross runway 35 left. 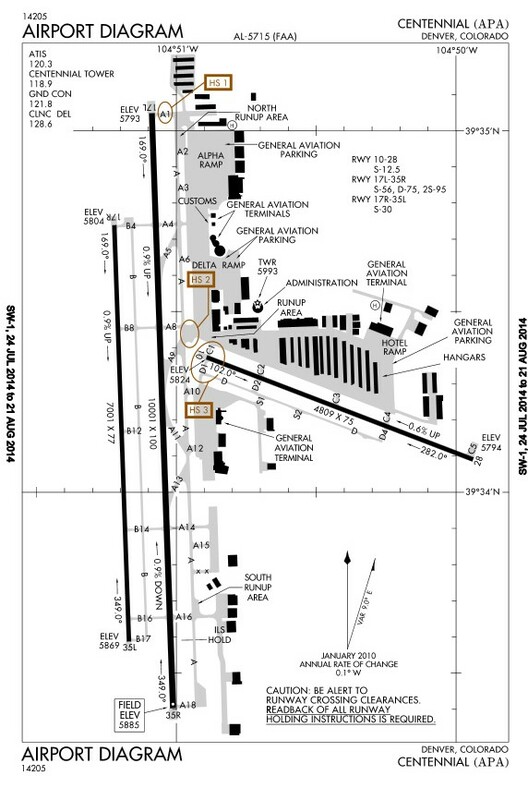 That is a good example to illustrate why this airport will serve me well for my instrument rating and commercial. The airport and the airspace environment are complex and I figure that after flight training here I won’t be afraid of any airspaces anymore. Hopefully. The key to mastering communication is being settled in the language you speak. That for, and – cough cough – for paying the rent, I started to work at Winter Park. I am being trained as a Barista and I had already two funny days. One awkward situation was when someone asked for an Americano and I had no exact idea of what that was. They told me it was just a shot of hot water with two espressi poured into it. Gross. At least there is history behind it. During the second world war the American Army had to drink good European coffee. For some unknown reason they didn’t like it and poured water in it. It is funny though that my Italian teachers never lost a word about the Americano while they thaught us about all other sorts of coffee…. 😉 Ciao!